A unique bronze helmet discovered in the deep by marine archaeologists off the Sicilian coast, which they have dated to a sea battle of 241 B.C.E. may have been a precursor of the lion-themed helmets used by Rome's Praetorian Guards, the personal bodyguards of the Roman emperors. The corps of the Praetorian Guards were established more than two centuries after that battle, by Emperor Augustus. Praetorian helmets also sported a lion-shaped relief, and were sometimes adorned with real lion skin. The helmet's dating is based, among other things, on pottery jars and other debris discovered on the sea floor at the site. Recovered from the site of the Battle of the Egadi Islands (Aegadian islands), northwest of Sicily, the helmet is a Montefortino, a Celtic style-helmet that had been worn across Europe, also popularly known as a "Roman helmet". These are easily identified: they look like half a watermelon with a knob on top and cheek flaps down the sides that tie at the chin. But this one had a difference: the lion decoration. "Montefortinos spread from central Europe, down through Italy then across into Western Europe. Variations were worn by the Roman and mercenaries on both sides of the conflict,” explains Dr. Jeffrey Royal. 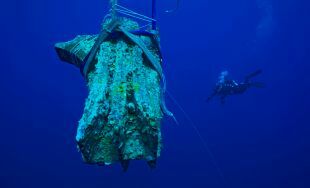 And indeed, say the archaeologists, all the helmets discovered thus far on the Egadi seabed were of Montefortino type. However, the newly discovered helmet has a unique feature: what appears to be a relief of a lion's skin embracing the central cone adorning its peak. Only one Montefortino helmet is known to have a relief on top, that appears to show a stylized bird. Possibly the lion-theme decoration can be traced back to a city allied with Rome where the influence of the myth of Hercules - who was often represented wearing lion skin on his head – was strong. It is also possible that the lion insignia indicated a rank of authority within the Roman army at this time. “The helmets could have been worn by any number of mercenaries of South Italian or Sicilian origin. The problem is, both sides were hiring in the same areas," Royal told Haaretz. "The Romans also wore a version of this style. Hence, some helmets were likely worn by mercenaries in service of the Carthaginians, but some my also represent Roman soldiers lost in the battle." 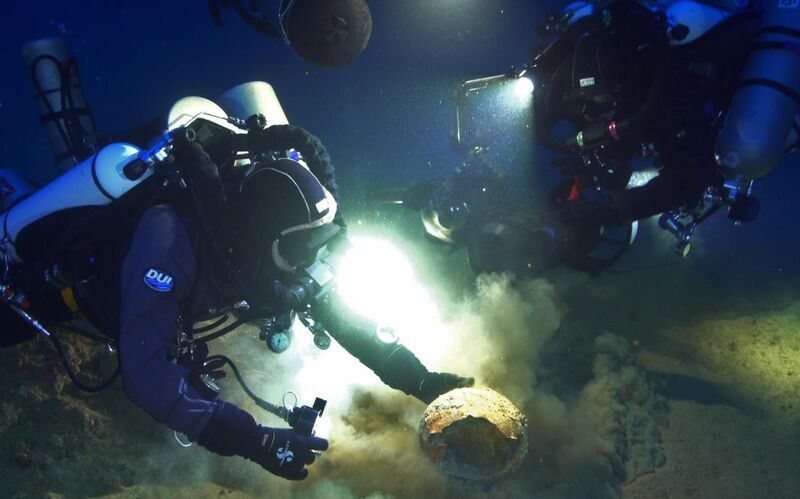 The helmet, heavily encrusted after more than 2,000 years under the Mediterranean Sea, is undergoing cleaning and conservation that the archaeologists hope will reveal more details. Other helmets discovered at the same site bore what appears to be Punic lettering engraved into the crest knob. The helmets could be a Libyan-Phoenician type, or worn by Greek mercenaries in Carthaginian employ, Royal suggests. The find is the latest in a string of discoveries made this year using unmanned submersibles as well as divers that have changed our understanding of naval tactics during the First Punic War (264-241 B.C.E.) , which knocked out Carthage, and made Rome lords of the sea. “The myth of the Romans as a land-lubbing culture fearful of the sea must be put to rest once and for all. They managed to defeat the preeminent sea power of the day, at sea,” says Royal, who has been investigating this ancient sea battle for years. 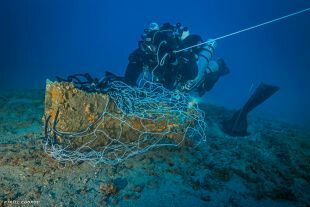 Diving at depths as deep as 120 meters, the marine archaeologists are surveying an area of about five square kilometers, littered with the relics of this decisive war. Bronze helmets, amphora, weapons and not least, ancient battle rams cast in bronze, were salvaged from the seabed. It was on March 10 of the year 241 B.C.E. that a huge naval clash took place off the coast of Sicily, between the Romans and their archenemies, the Carthaginians. The struggle would put an end to the first Punic war and set the Roman republic on its road to empire. Historical documents place the battle near the island of Levanzo, west of Sicily. According to the second-century B.C.E. Greek historian Polybius, the Carthaginian fleet, led by the famed general, Hanno, was heavily loaded with supplies of grain for the remaining Carthaginian colonies on Sicily, which the Romans had besieged with their superior land army. But when Hanno passed the island of Egadi off Sicily, he discovered that the Roman navy was already there. It attacked. Hanno lost hundreds of ships, escaping with just a few. Returning to Carthage, he was prosecuted for mishandling the fleet, and was convicted and sentenced to death by crucifixion. Previous attempts to find the exact location of this crucial battle had focused on shallow waters nearer the island. 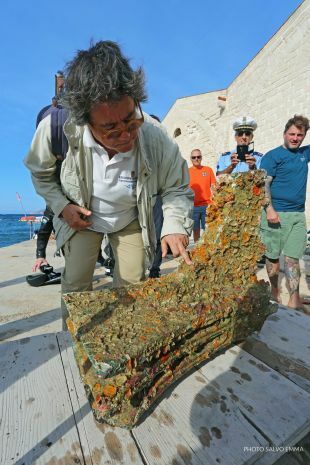 But stories told by old Sicilian divers of lines of ancient lead anchors lying on the seabed off the Egadi Islands to the west of Trapani guided Sebastiano Tusa, professor of pre-history and Soprintendenza del Mare, Sicily to the battle site. “After reading the historical documents detailing rough and windy weather conditions on the day of the battle, the 10th of March, 241 B.C.E. I studied the placement of Carthaginian camps in the area. A convoy of Carthaginian ships had set out to supply the camps on Mount Erice, breaking the Roman sea and land blockade. 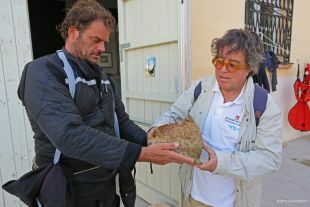 Their route with the westerly wind would have taken them close to the smallest island, Egadi,” Tusa explains to Haaretz. 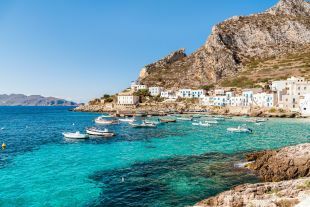 More convincing evidence was discovered in 2004 after Tusa listened to locals from the port of Trapani and to divers exploring the Sicilian coast, and discovered that fishermen had dredged up a large bronze ram near the Egadi that year, which they sold to a Trapani dentist. This fit with the story that Roman admiral Lutatius Catulus had given orders that anchor ropes had to be cut instantly on his signal, freeing his ships to make a surprise attack. 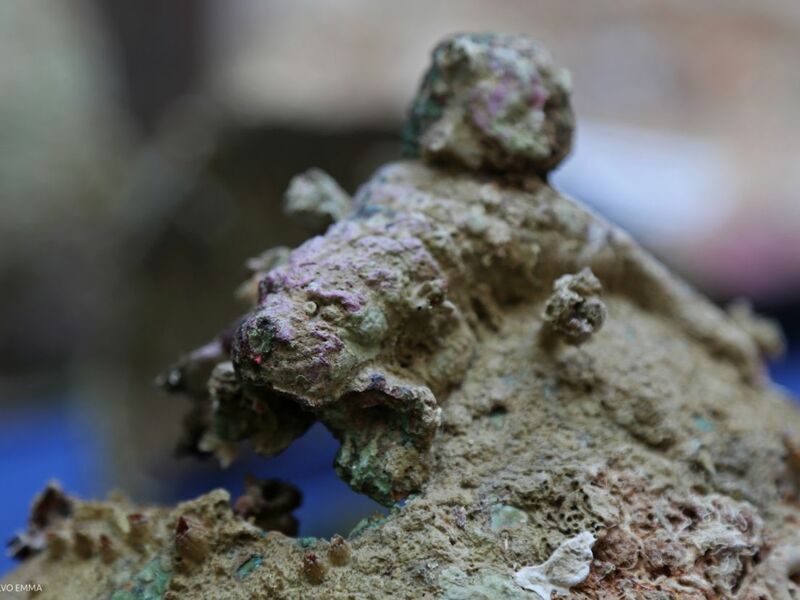 Following the discovery of the first bronze sheathed ram, the nonprofit organization RPM Nautical Foundation was called in and a search for ancient artifacts commenced. Using their research vessel Hercules, equipped with a multibeam echosounder and a small robotic underwater submersible, the seabed was combed. 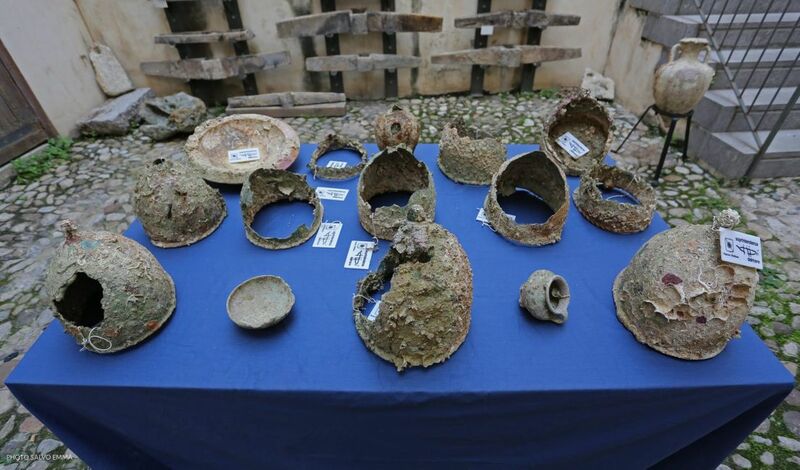 Among the finds were hundreds of amphoras. One of the interesting points is that the manufacturing areas and graffiti found on some of the amphoras show that trade continued between the Italian mainland and North Africa, through Sicily and the smaller interceding islands, though the regions were theoretically at war. It is not uncommon throughout history for commerce to continue between areas under adversarial control. War is expensive, and the sides each been supplies, Royal explains simply, adding, “Overseas trade and shipment was a primary mechanism to sustain these. In general, these events also highlight the importance of overseas transport for maintaining military operation far afield of a home state's territory." Dr. Royal, Prof. Tusa and the RPM Nautical Foundation have also discovered that the ships that were participating in the battle were much smaller and more powerful then previously thought. 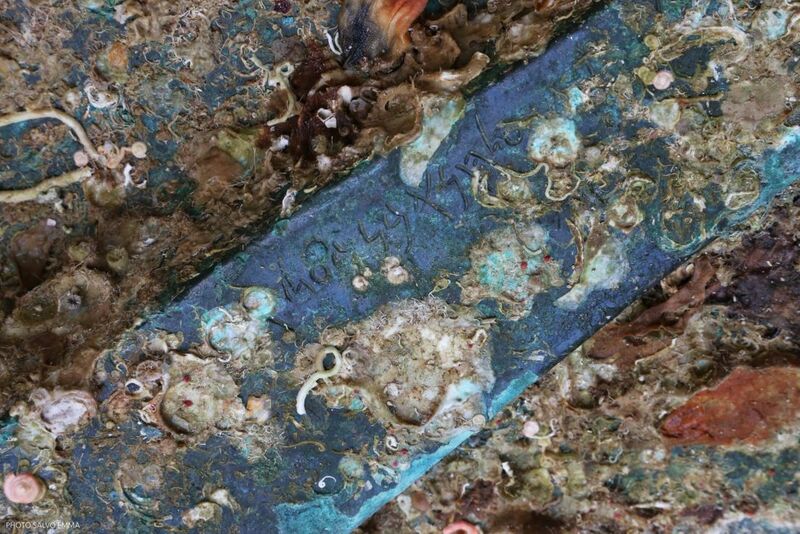 Their new evidence is the discovery of 13 bronze battering rams, the main maritime weapon of the warship situated at the prow. These were cast to custom-fit the bows, ergo their size reveals the dimensions of the keels. Based on those measurements, the researchers believe the ships were triremes, the principal type of warship in the Roman-era Mediterranean, which boasted three decks of oarsmen. The archaeologists calculate that the ships could not have been more than 30 meters long and just 4.5 meter in beam, far less than the 36 meters previously estimated for the Athenian trireme. (The size of Athenian triremes had been estimated based partly on ship sheds excavated in Piraeus, and the reconstruction of a full-scale ancient Athenian trireme, the Olympias). However, that reconstructed Olympias wouldn't even have fit into many of the ancient ship-sheds, based on archaeological surveys, Royal explained to Haaretz. "Requirements in shipsheds are not tight fits; rather, they are spaces where room is needed to work – to perform maintenance, repairs, refits, etc.,” he said. The reconstructed configuration of the ship's bow was also based on the famous ram found in 1980 at Atlit, a bay in northern Israel, one of the biggest bronze casts ever discovered. In battle, the trireme was propelled solely by its 170 rowers. These wooden ships are believed to have been able to achieve a speed of 10 knots at the critical moment of impact. Rams mounted below the waterline had three horizontal planes that would slice into their targets’ timbers, cracking the enemy ship. The dispersal of amphorae and other goods on the seabed indicates that ships were indeed sunk, but did not break up. Since the Carthaginians lost the sea battle, the researchers suspect that most of the sunken ships found so far belonged to the Punic fleet. 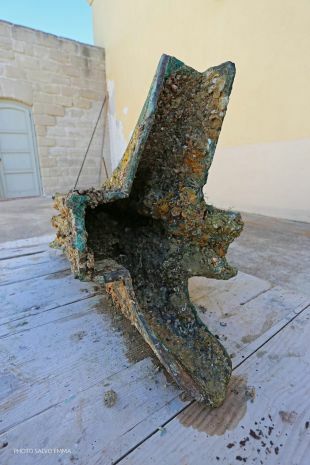 The archaeologists therefore postulate that the battleships found on the Sicilian seabed had been captured by the Punic fleet from the Romans at the Battle of Drepanum in 249 B.C.E. Polybius mentions that 97 Roman ships were captured there. Also, additional ships were captured afterwards further south. “These were sent back to Carthage and folded into their fleet. This was hardly the only instance of this: both sides captured the other's warships whenever possible," Royal says. "As they were communicating warship construction technology through through capturing, the state of warship configuration and development would have remained relatively close." This first Punic War, characterized by some of the largest naval battles of antiquity, would drag on for more than 20 years. The battle of Egadi, in 241 B.C.E., was a turning point: the Carthaginians were defeated and forced to abandon Sicily. Rome also snatched Corsica and Sardinia from their grasp. The amphorae, the bronze rams and the helmets represent the loss of human life, and provide a direct and tangible link to the people who participated in this event that put Rome on the road to Empire.